SCENEHOUSE is a centre for training in design for live performance based in Scotland. Scenehouse offers a range of courses in design and scenic skills. These focus predominantly, but not exclusively, on theatre in its many forms. We primarily explore spatial design and scenography; it’s conception and realisation. We also have input from professional directors and lighting and sound designers. The courses can be taken individually or in combination. The two parts of the Design course are designed to dovetail into one, and can be taken along with the Make course. We refer to this full six weeks of study as the “Scenehouse Programme”. 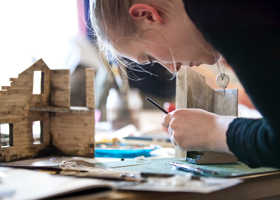 Our courses are intended for mature students, and applicants must be aged 21 or over for entrance to the Design courses, and over 18 in order to attend the MAKE course.. Scenehouse courses are vocational in nature and we do not currently offer academic awards. We do however provide a certificate of attendance and completion as well as a high level of formative appraisal. Scenehouse aims to take creative artists with a first degree or equivalent experience and equip them with the skills to start working in theatre and other creative industries. Access to the course is by application. There are 8 places available for the Design Make and Paint courses. The Scenehouse programme is unique within Scotland in offering the “hard skills” of practical theatre design in an industry context. What we offer is intensive vocational training for mature students, which is fundamentally different from postgraduate study. By comparison, an MA course will typically last a year, an MFA two years. Such programmes tend to be exploratory, and research based. The duration of the course allows the student to investigate and reflect at length on their learning. Study is often undertaken within a peer group, or self led. By contrast we aim to provide an experience that is vocationally focused, delivered by professional practitioners to equip graduates for the industry. If you have found that your studies or work to date have advanced your innate talents but not fully provided you with the practical skills you need to work, then this may be the course for you. Scenehouse courses are delivered intensively. The 70 hours of staff tuition and support which a student has on the Design Part 1 course is greater than the 65 contact hours most institutions budget for a Post Graduate Diploma. The full 4 week design course provides more staff contact than an entire year on a typical MA programme. Theatre practice has its own culture and terminology, the comprehension of which is vital to employment*. Scenehouse is staffed exclusively by theatre professionals who combine active careers in the industry with many years of experience as tutors at undergraduate and postgraduate level. We ensure that our Design students work with professional and high calibre directors in a way that replicates the real - life design process (albeit in a compressed form), and get feedback form working professionals at all stages of the course. Are these courses like a summer school? We prefer to think of the Scenehouse Programme as an enjoyable sort of theatre “Boot Camp”. The sheer depth and breadth of the material we will cover, and the quality of the professionals and guest speakers students will make contact with, will make it unlike any summer school experience. Students undertaking the Full Design Course will have experienced every stage of the creative process from script analysis to fit up and strike*. They will have gained model making and scale drawing skills. Those taking the Make course will gain a comprehensive knowledge of the materials and techniques used in scenic construction and prop making. Students will leave us fully orientated for the workplace. * If you’re not sure what a “Fit up” or “Strike” are - you will be by the end of the first week!